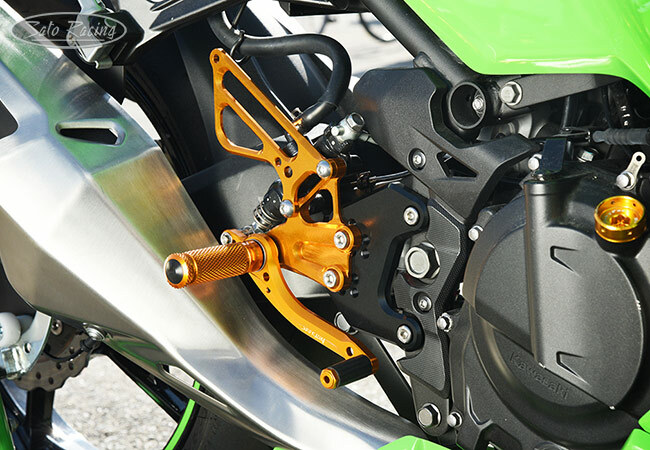 SATO RACING 'Race Concept' Rear Sets for 2018 Kawasaki Ninja 400 (along with the non-U.S. Ninja 250) are pure, no-compromise race-spec Rear Sets, designed for track-only Ninja's. 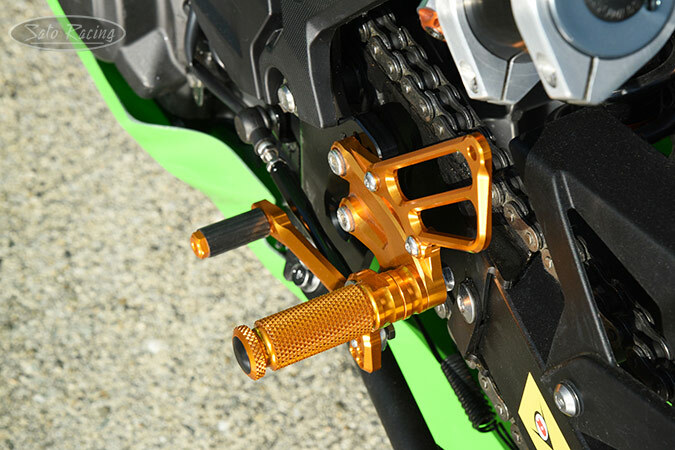 CNC-machined out of high strength billet aluminum and anodized in a vivid 'Osaka Gold' finish with contrasting Black base plates, these premium racing Rear Sets feature a modular design that provides 7 adjustable foot peg mounting positions that bring your feet significantly higher up and further back compared to the stock foot pegs, for a much more aggressive riding position that is ideal for tackling the fast straights and steep lean angles at the track. Provides a dedicated reverse shift pattern. NOTE: Not recommended for street use - No brake light switch hardware is included. 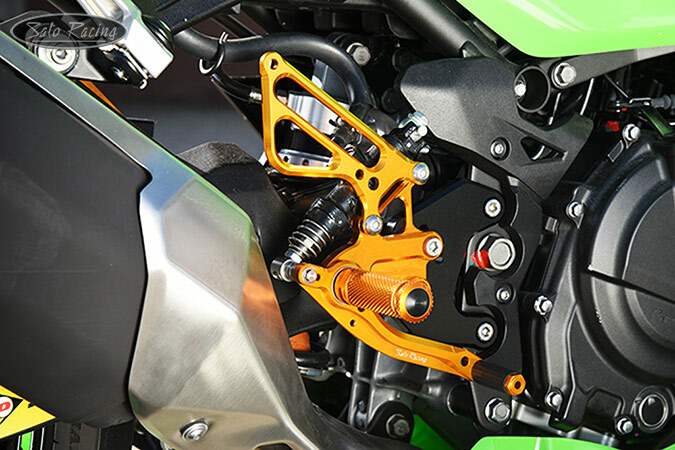 (For more street-friendly Rear Sets, see our standard Ninja400 Rear Sets ). U.S.-spec Ninja 400 shares the same platform and is nearly identical except for engine displacement. 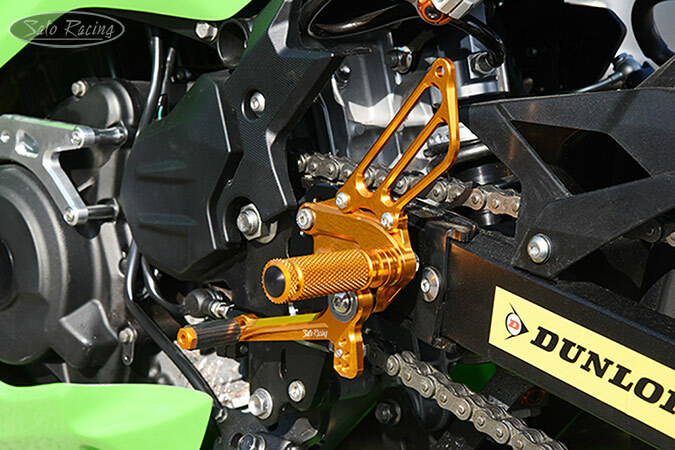 Modular base plate design provides 7 possible mounting positions for the rear set assembly. with a solid feel. 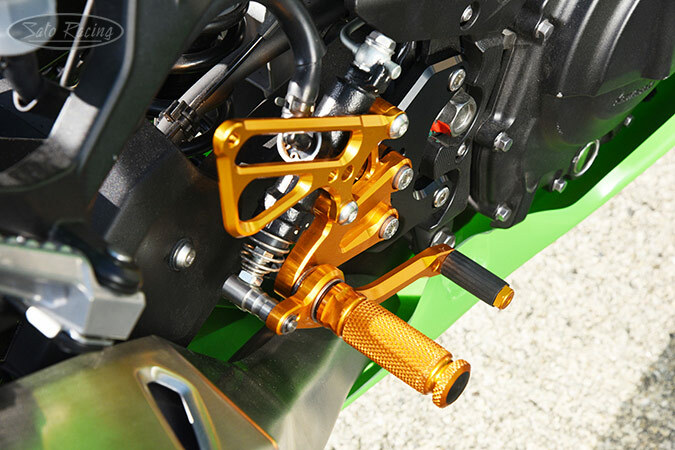 To maximize clearance for the exhaust, the brake pedal pivots from the foot peg axis. This can be especially useful if installing together with a custom or aftermarket high mount exhaust. These racing Rear Sets provide a dedicated reverse (GP style) shift pattern. The foot pegs feature a finely knurled pattern for excellent grip characteristics, along with a comfortable, intuitive feel. 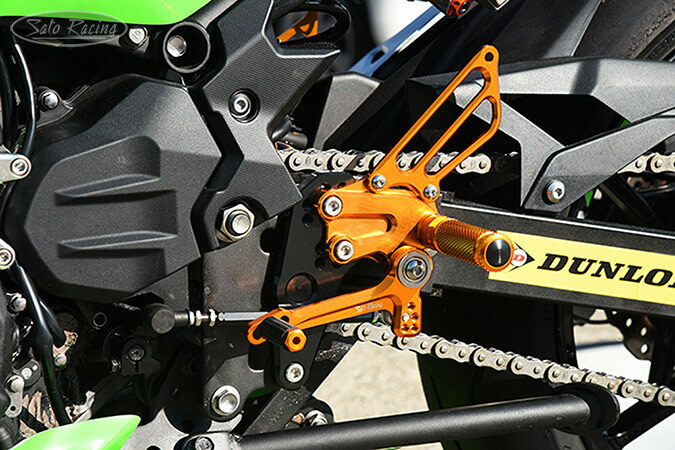 Our foot pegs have end caps made of abrasion-resistant Delrin, so if the end of the foot peg touches the ground, the end cap will help it slide smoothly instead of scraping.